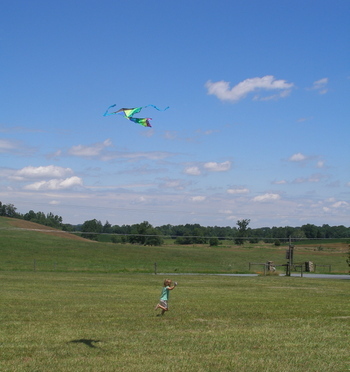 Did you know, according to my extensive online research that one can have TOO much wind when flying a kite? We’ve had these two kites stored away in the closet waiting for the perfect day…and yesterday seemed like the day. Our very nice kite, already equipped with a tail (also important acc’d to my research), did nothing but climb, climb, swirl and nose dive. Over and over again. So when we came inside with such kite-flying bad luck, I (of course) googled " how to fly a kite", wondering how on earth it was possible that I didn’t know how to fly a kite. We had all the elements–good kite, good wind, and fast little legs. So, apparently after doing a little research, it IS possible to have too much wind. So, that’s where we’ll leave it for now. Meanwhile, Emma has found a way to cause me to come frighteningly close to losing my mind. I’m on my fifth (or sixth, I’ve lost count) potholder in less than 24 hours. She has only mastered putting the first rows of loops on the loom and takes great joy in making up different color patterns. I am left with the over-under-over-under part and the finishing. The over-under part is maddening. I have those words, "over, under, over, under" going through my brain even when I’m not at the loom. I know I could just turn the girl away, but she’s begun to make these deals with me that are hard to turn down. For example, today’s deal was, "if you’ll just make the rest of my potholder and finish it for me, I’ll put Mary to bed for naps and read her a story." Seriously, now. Can a mother turn down an offer like that??! They were in there reading Mother Goose. She even got her a glass a water and tucker her in. But, I have told emma that if she makes me get out that red plastic crochet hook and do anymore potholders in the next few days, this will happen to her. I think she’s got the message. the potholders are so lovely and colorful!!! Gorgeous! You and me both sister! Mine is striking bargains for me to finish his latch hook project! 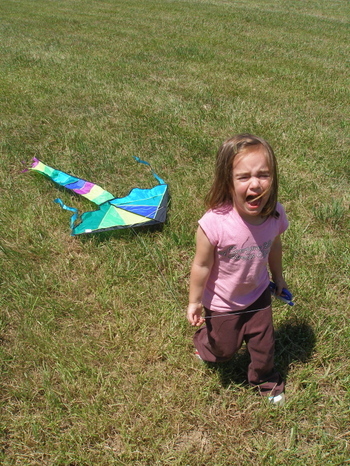 So sad for little Miss Angry About the Kite! I l o v e your new banner, and Emma’s photos. i know the potholder feeling….i finally got kate to do the over/under part, but i still have to take hers off the loom. just keep going – she’ll run out of loops eventually! If it is too windy to control a kite sometimes it needs a little weight. When I was young we used to tie stuffed animals to our kites not only for control but so they could have the ride of their lives. I still dream about flying in a kite. Oh, that’s hysterical! Calvin is all about the over-under part, but not the straight across, first part. What’s up with that? 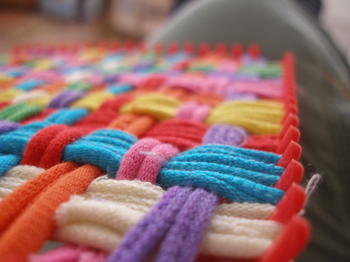 those potholder looms come out once or twice a year around here, usually right before a holiday or grandma’s birthday. i always struggle when you try to finish them off and the loops start popping off the pegs. The potholders? The potholders? How can everyone talk about the cute little “brings-back-memories” potholders when there’s that poor little crying face with the kite dragging behind her? Oh, poor dear, I hope the kite-flying goes better the next time you all dare to brave it again. Oh, and you know you can turn those potholders into little purses, beanbags, and stuffed animals (chicken can be made by folding diagonally), sleeping bags for teddies, etc.! LOL….too funny! Sounds like you’re having some kind of fun. Good tuckering out exercise, free nap sitting and some cute potholders. Those potholders bring back memories! My grandma just gave me two box sets of the contraption thingie. Now I just need a bunch of those loops. Think I’ll wait til Nissa gets older…haha! Sounds like maddening fun. I’m going through the same monotonus sorta ritual with Josiah. He loves this kinetic sculpture thing we got and he wants to see me put it together and have it fall down over and over. My nerves are shot. Emma’s getting you ready for your next swap, or Christmas, or the local craft fair, or whatever! I had one of those losing my mind days yesterday as well! Love the kites and colors. i remember those. i was totally addicted to making potholders for a whole summer. what a great place they have for kite flying. it looks so beautiful. hope they get their good wind conditions soon. How sweet! My annoyance right now is having to spell constantly so my 5 year old can write letters to EVERYBODY we know! “Mom, how do you spell I miss you?” Yelling across the house,( Mooooom, how do you spell Aunt Rae?). We will miss it one day! Her way with color is great. Too bad it has you as slave to the loom. Oh my goodness… I TOTALY remember those things. Do they still sell them? I think Abby needs one for her 5th birthday next month. It looks like you have a lovely place for kite flying, even if it was too windy! I remember making those potholders as a kid, and I could never finish them either. I think my mum always did that part too. I contemplated getting Lily one of these looms, but then remember how much of s pain it was, and I know that if she were to take on the task I would be doing the work. Ahhh, little Mary looks so sad. 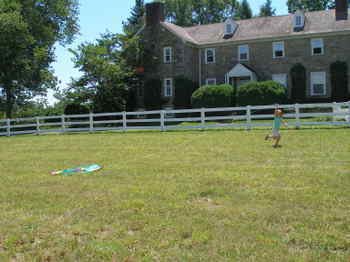 We love kite flying around here. Your post reminded me of the Arnold Loebel series, “Frog & Toad”, where there is one chapter exactly on the subject of trying to fly a kite! A very cute story! If you aren’t familiar with it, it is worth a visit & a borrow from the library! I was just thinking that your life sounds so much like mine! Little girls who want so much to do craft like Mummy only Mummy has to do most of it. And then I realised you also have 3 gorgeous girls. My middle one ‘borrows’ the camera often and a few weeks ago dropped it on the floor! It will cost more to fix it than replace it. Hmmm she is a challenge! You live in a very beautiful place – those lucky children! 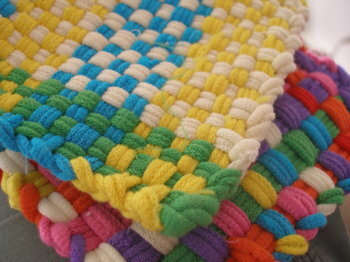 I loved making those potholders when I was kid. Amazing that those kits are still around all these years later.